This article is the start of a series of articles shedding light on the complicated world of MADI connectors and variants, accompanying the upcoming release of our ml:mio MADI converter and splitter. In this first installment, we talk about the origins of the many different MADI variants. In the late 80’s, the demand for a serial multi-channel format became more and more apparent. The audio industry was in need of a modern digital protocol capable of sending multiple audio streams. The goal was to find an alternative to the error-prone and expensive parallelized multicores; an alternative that was both vendor-independent and open to the public. Development of a new standard started in 1989, and in 1991 the first issue of the MADI standard was released. The engineers of the AES standards committee decided to combine existing and proven digital technologies to form MADI. The procedure is straightforward: start by taking two 24-bit samples of digital audio and encode them in the widely-used AES3 format. Then, concatenate 28 or 32 of these AES3 channels and send them out on a high-speed carrier, padding the remaining timeslots in the frame with non-audio symbols for orientation within the stream – and voilá: the MADI stream is complete! While the standard defines several possible channel and sample rate configurations, real world applications seem to prefer 64Ch@48kHz and 32Ch@96kHz variants. This is due to the fact that these make efficient use of the available bandwidth and allow for a maximum number of channels. The result of this encoding scheme is a very robust and simple data stream, with almost no additional configuration needed for embedding audio and control information. The basic idea is to simply connect a MADI output to a suitable input and you’re done. Sending a constant stream of information as opposed to small packets of data is an unusual approach nowadays, but very well suited if the data needs to be transported in quasi realtime, as it avoids the unnecessary step of packetizing stream data. The effective transmission range is only limited by the underlying transport medium; distances in kilometers of up to two digits are possible without the need for additional hubs, switches or routers. Due to its simple implementation and open nature, MADI became the first multi-channel digital audio transport standard established worldwide and across many different manufacturers. However, in the early 2000’s, the world of MADI became more complicated: manufacturers now required a more versatile standard, allowing them to send additional information. The AES standards committee allowed usage of certain symbols for control data, but their specific implementation was left up to individual manufacturers, who started defining their own protocols on top of the existing control data slots in MADI. The available bandwidth left in MADI for control data is roughly 1Mbit/s, which leaves plenty of space to embed non-audio information – such as MIDI or remote commands – into the stream. 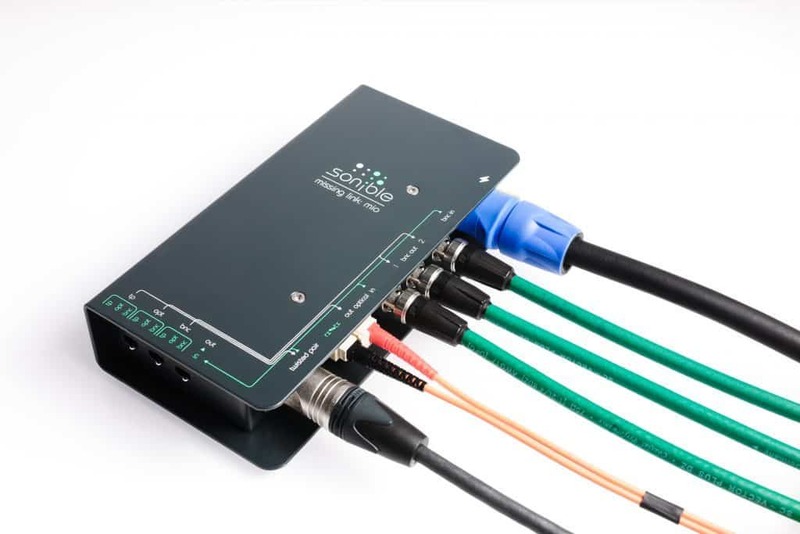 There are a few choices for the carrier medium of MADI streams: the standard defines two possible connectors: 75 Ohm BNC and multimode SC optical. While the 75 Ohm BNC connector was developed to be rugged and suitable for field use, the SC optical connector was never intended to leave network operation centers. Fortunately, the latter can easily be upgraded to a more rugged optical connector, since the transceiver modules work with a wavelength of 1300nm, which is also a standard in the communications industry. The SC connector is still considered the default optical MADI port. 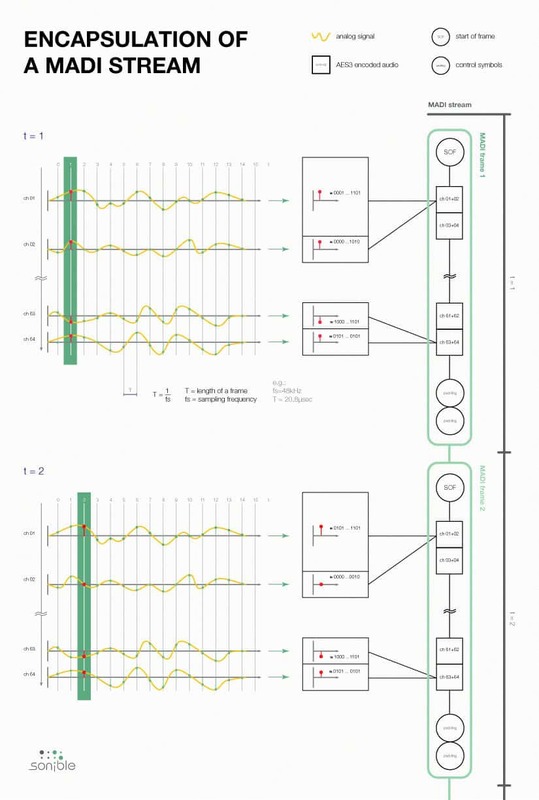 Following the definitions of the AES, setting up a full duplex MADI stream would require two connectors – one for each data direction. Many vendors were not satisfied with this solution and decided to combine two MADI streams into one CAT5 cable, which had already been widely adopted by the communications industry. Although the need for a second cable was omitted, a new copper based connector had to be introduced. Since there was no recommendation by the AES, these implementations were always vendor-specific and only designed to work within the product portfolio of that particular vendor. However, regardless of what augmentations have been made to the standard, there is still a MADI stream at the core of it all, making it possible to convert back to regular MADI at any point. As of now, the AES standards committee is working on an addendum to the current MADI standard, describing the recommended transport protocols for twisted pair media (MADI-TP). This will very likely break the current encoding scheme, and also break compatibility to most current vendor-specific solutions for the time being. It should also be mentioned that there are no plans thus far to increase channel capacity by increasing the carrier clock rate, although – from a purely technical point of view – this would be a promising approach. If you compare the data rates achieved in coaxial video transmission (up to 12Gbit/s) with those used in MADI (0.125Gbit/s), you can see that this wire still holds a lot of potential.